Monitoring is the term we use for pro-actively checking how students are progressing with learning activities such games, discussions, tests etc. Very often, the teacher monitors by moving around the class and checking students’ work as they write (or listening as they speak, in the case of speaking skills). Monitoring is essential to check students understand the task instructions and to pick up on major errors early on. It’s also a critical element that you will be assessed on. If you fail to monitor in your lessons, you could fail your CELTA course. A careful approach must be taken when monitoring students writing. On one hand they need time and space to practice the skill; you should avoid distracting them from the task wherever possible. However, on the other hand, you still need to be aware of any major problems and misunderstandings, and of course demonstrate your monitoring to your CELTA tutor. When the first student has finished, pick up their written work and read it through. This gives the others time to finish, keeps the more able students on their toes, and shows your CELTA tutor that you are taking a pro-active approach. If you spot any major mistakes, ask the student to check that section carefully – DO NOT tell them the correction, but give them the opportunity to self-correct while the class finish the task. 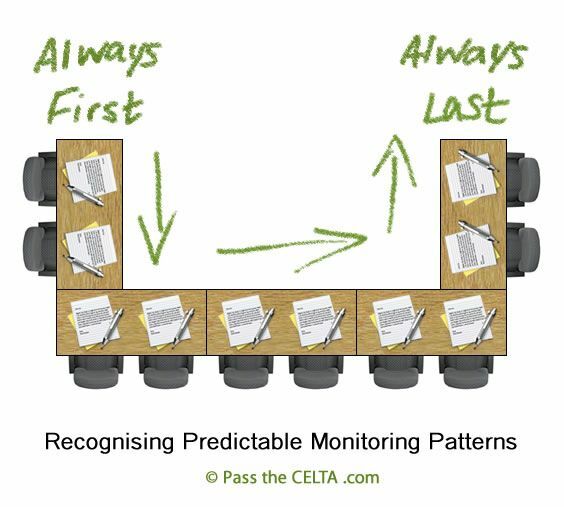 It’s also a good idea to avoid predictable patterns in your monitoring; most CELTA candidates naturally want to walk around the desks sequentially from left to right (or right to left). This means they risk rushing the last group of students and not spotting misunderstandings of instructions in time to correct them. Try to mix up the way you walk around the class and always keep an eye out for students who may put their hand up for help. Probably the easiest skill to monitor. Just position yourself somewhere unobtrusive and tune in your ears to hear the students talking. If you do notice misunderstandings, you need to make a decision about how many students are struggling: if just a couple you can correct them personally, if the majority of the class has misunderstood you should stop the activity and go through a clear example as an open class. Errors or slips in meaning, form and pronunciation, all of which you can use for delayed error correction later in the lesson. Errors are mistakes made because students haven’t yet encountered the target language; slips are mistakes made (despite knowing target language) because the students are tired, uninterested, forgetful, stressed, pressured etc. Mistakes in the target language. For example, if the target language is 3rd conditionals, then you should listen out to make sure they are indeed using correctly formed 3rd conditionals. Having your ears at the level of the students makes listening easier. You reduce the teacher-presence in the room and students don’t feel under pressure. You are clearly demonstrating your monitoring skills to your CELTA tutor. This is the most difficult skill to monitor – there’s simply no way to know if your students are listening attentively and understanding the CD/tape. Of course, you can watch them during listening to see if anyone is playing with their mobile phones or straining to hear properly, but that’s about it. With any listening activity it is always best to use a written task to see how well they understand the material. Gist tasks aren’t that useful for monitoring listening skills as they usually involve just a few top-level questions. Instead, I recommend using detailed tasks (for specific information) with answers that are easy to read upside-down (from the teacher’s perspective) as you need to avoid intrusive monitoring disrupting your students from the lesson aim of listening. The best way to make sure you can easily read their answers is to adapt activities from the book onto handouts… that way everyone is writing on the same template that you can compare directly with your version of the correct answers. Very similar to monitoring listening skills in that you never really know how well students are performing until you give them a task to test their comprehension. Use large, templated worksheets to avoid having to read handwriting from students’ notebooks. Unlike skills lessons, language lessons (grammar, vocab and function) don’t usually involve gist or detail tasks – instead they use controlled practice and freer practice tasks. The key to successful monitoring of CELTA language lessons is careful preparation of the activities. By taking them ‘off the book’ and creating worksheets to hand out, students will all write their answers in the same format and, with a bit of clever planning, large enough to make your life much easier when reading upside-down! You can be a bit more intrusive when monitoring language lessons. Don’t wait for the feedback stage before pointing out mistakes to students – but avoid spoon-feeding them answers. Instead, it’s much better to point to the question on their worksheet and say something like “Are you sure this one is right? Have another look at the tenses you’ve used.” – Remember that students learn better by making, identifying and fixing mistakes themselves. Worksheets are your secret weapon for effective CELTA monitoring. Learn how to adapt activities in the books to remove distractions and provide a large, easily readable format. Even if you have amazing eyesight and can read your students’ work upside-down from across the room, make sure you still clearly demonstrate your monitoring to your CELTA tutor. They need to know you are actively monitoring at the correct times. Monitoring is your last chance to make sure students understand the task you have set them. If you don’t pick up on misunderstandings you can end up with half the class having just finished the wrong exercise! Save yourself the stress and make sure everyone is working on the correct task.